Here's something you don't see every day. 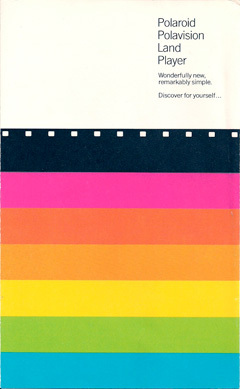 Although I seriously doubt anyone has a need for it, here's the manual for the Polaroid Polavision Land Player. It's a great looking manual, with really well done color marker illustrations. The Polavision Player was required to play back the weird Polavision Phototapes. At one time I had an entire Polavision system - a gift from my uncle, who knew I was into old Polaroid stuff. But I was never able to come across any blank Phototapes. The whole system was an expensive, short-lived forerunner of home video cameras, and never really caught on. If you're interested, you can read more about the ill-fated Polavision system at The Land List. I found this camera in a thrift store for $15.00 I received it as a Christmas present since I'm into film. I guess I'll just keep it as a keep sake.